Sherlyn’s plan to set-up her marriage with Rishabh is working well. Preeta knows the truth about Sherlyn and has thought of a plan to stop her. 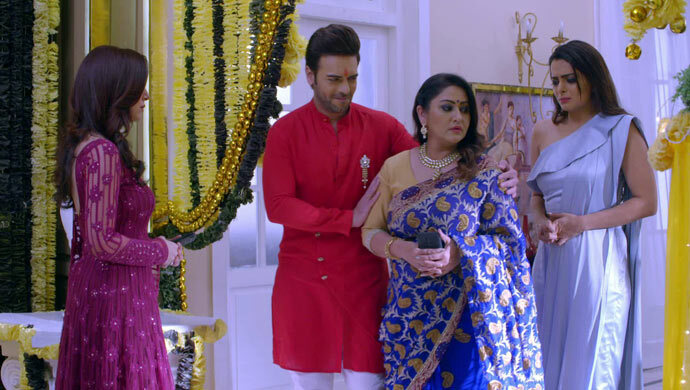 In last night’s episode of Kundali Bhagya, Rishabh falls into the trap set by Sherlyn and Prithvi. He drinks bhaang and ends up in the room with Sherlyn. The family catches them together, and to avoid embarrassment a decision is made to get Sherlyn and Rishabh married. Since Preeta knows the truth, she decides to make Sherlyn spill the beans and stop this wedding. In today’s episode of Kundali Bhagya, we see Prithvi thank Sherlyn’s mom for agreeing to get Sherlyn married to Rishabh. Karan loses his cool at the wedding announcement and is desperately looking for a way to make this marriage plan fail. Sherlyn, meanwhile, has said no to the wedding to make Karan and his family beg to be married to Rishabh. Preeta decides to come up to Sherlyn under the pretext of convincing Sherlyn to agree to the marriage. When she gets her alone in a room, she confronts Sherlyn about her pregnancy and the fact that she already has an unidentified boyfriend. Preeta demands answers as to why Sherlyn is trying to fool Karan and Rishabh’s family, and she forces her to come out with the truth in front of the entire family. Karan tries to convince Rishabh that Preeta will handle the situation and will break off the wedding with Sherlyn. Meanwhile, Prithvi starts panicking after hearing that Preeta knows Sherlyn’s secret because it would dent his plans to marry Preeta. Sherlyn then turns the tables on Preeta where she tells Preeta that the whole family is on her side including Karan and Rishabh’s entire family. Even Karan himself couldn’t convince anyone to call-off the wedding. Sherlyn then also states that there is no proof of her boyfriend and her pregnancy which make Preeta’s story even weaker. While Sherlyn is telling her entire plan to Preeta, on the other side, her mother talks to the elders in the family who promise her that Sheryln will marry Rishabh in 12 days and they have always wanted Sherlyn to be their bahu. Is Preeta out of ideas to bring the turth out of Sherlyn? Karan and Preeta have 12 days to find a loophole in Sherlyn’s foolproof plan. Stay tuned to know more. Catch all the episodes of Kundali Bhagya, exclusively on ZEE5. Kumkum Bhagya 20 March 2019 Preview: Pragya Agrees To Send Prachi To Delhi?